A funky hotel in Oak Cliff has a patio that puts everything in perspective. The broad ocean. The tall mountains. A desert sky, the Marfa lights, a widow’s walk, an opera box, binoculars. Living with small children sometimes creates focused tunnel vision, life through a telescope backward. Views are an antidote. A complement. Ah, room to see, please. The Belmont is a bar with a view. The balcony’s low, white stucco wall throws downtown into relief. Bank of America Plaza, Reunion Tower, Renaissance Tower—all those glass fortresses shine and shimmer after the sun goes down and the whole of downtown begins winking. Bar Belmont is part of the Belmont Hotel, in Oak Cliff. Built in 1946, it was designed by the influential Dallas architect Charles Stevens Dilbeck and restored by developer Monte Anderson in 2005. It is chic and white and Art Moderne. And it smells sweetly of wood burning. Smoke, the upscale barbecue restaurant with a focus on local ingredients, is part of the hotel, too. One Friday night, my husband and I met up with two other couples on the bar’s balcony. The place hummed as the sun went down, then settled into the quieter patter of conversation. We opted for beer, Fireman’s 4, instead of some of the fancier cocktails with ironic or clever names (Bonnie and Clyde, Barbara Allen). Fireman’s is brewed near Austin, the city that half the people at our table left for love of the other half. Austin was an apt topic of conversation because the Belmont feels like Austin’s beloved Hotel San Jose. My stepfather, on entering Smoke for a Sunday night dinner with the grandkids, said, “This is kind of an Austin place.” Yes. I’m not sure what it is exactly about the Belmont that evokes Austin’s real and cool—the modern plastic chairs in blue and white on the Bar Belmont patio perhaps. The guy with the hipster patches on his tweed jacket talking to a wild-haired rocker in soccer shoes. Maybe the cool brick floors or the lovely white stucco. The fact that it’s in hilly Oak Cliff. The tattoos on the bar waitstaff, who were equally fluent in courtesy and irony. 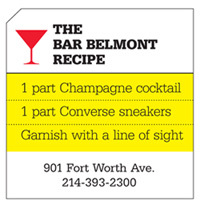 Community-minded folks will likely appreciate the Belmont. It has partnered with an Oak Cliff landmark, the Texas Theatre, and KXT 91.7, the fabulous new public radio station, to provide a summer music series of concerts called Barefoot at the Belmont. The Belmont also hosts free pool parties every summer Sunday afternoon and twice monthly movie nights. I wanted to see the sunset from the balcony, and so returned early one weekday evening. It was quiet, only a dozen or so folks there, some perhaps guests of the hotel. I ordered an Elizabeth Taylor, a Champagne cocktail made with crème de violette, a purple-tinged glass of bubbles meant to carry the essence of violets and a movie star’s eyes. And then, as sunset approached, the skies purpled up and dumped floods of rain on us. Late on a Wednesday afternoon, 75 degrees and weather so gorgeous my grandmother would have sworn people all over town were buying houses (“So much light!”), I escaped for an hour to Bar Belmont. I walked past Smoke, passed the cacti and rosemary growing in planters, and wandered up to the bar. I skipped the interior, headed straight for the balcony, then leaned against a round cushion on a low banquette. Hipsters and beautifully coifed businesswomen began to arrive. A few people who looked like hotel guests took over a table inside. A barman wore a fedora-like hat. I ordered some Republic tequila, some barbecue fries, and, at long last, the sun sank into the horizon. The sky melted into a color so huge, my eyes felt made of magnifying glass. Marfa lights, widow’s walk, opera box, Bar Belmont.